Part of my changing jobs was an extended trip to Europe. It was both exciting and daunting. 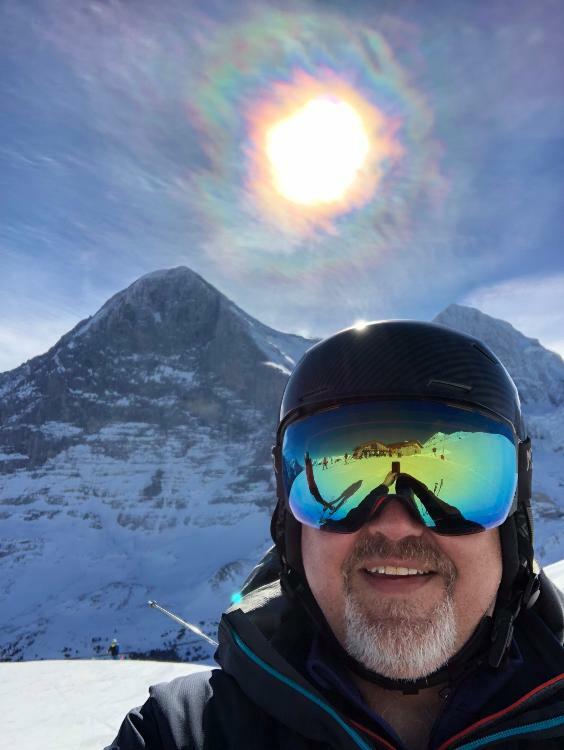 The schedule called for me to first be at my son’s Eastern Champs Races for 6 days then on the last day of the races leave at lunch time from Sugarloaf and fly out of Montréal to Geneva with a connection in LHR. The weather was bad in Europe with rain low, snow high and high winds all week. I had to attend an afternoon meeting the day I arrived and was late due to airline delays. I’m visiting the plants and training with a fellow American, 2 guys from Italy and an Austrian it turns out raced on the Europa Cup circuit. Truly some great guys that would become friends over the next several weeks as we traveled around Europe together. We all were happy when the Friday session ended at 3 so the Euro guys could drive home. My US peer planned to spend his weekend split between Bern and Zurich so we drove to Bern and he dropped me off at the HBf (main train station). I bought a 1st class ticket so I wouldn’t be packed in and headed to Wengen which requires changing twice to smaller gauge trains. Wengen is a no cars village at 1200m elevation. Nice and compact. It’s a great place to stay for this region. 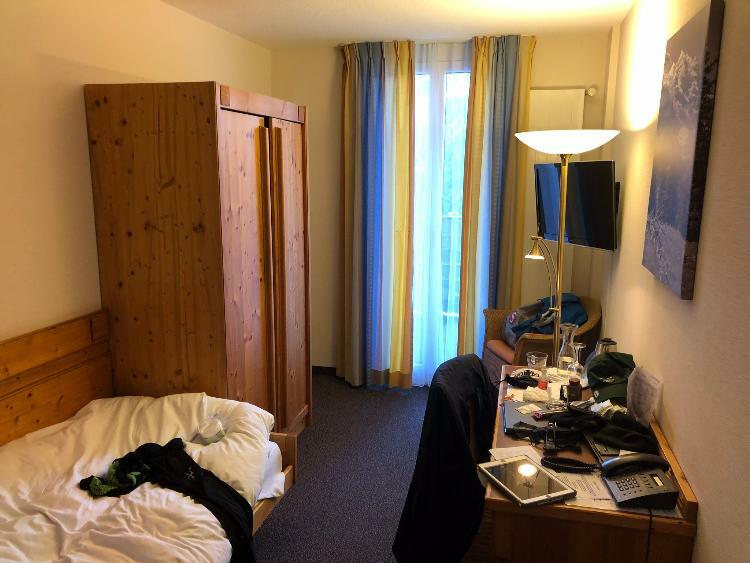 I had booked a single room at the Sunstar right on the Main Street and about 200m from the cable car. English is widely spoken here with a heavy Brit tourist crowd that frankly became a bit annoying. Why go to the Swiss Alps and ask to eat fish and chips? The Brits in general ski as well as Midwestern or Texans in Colorado and are viewed as such by locals. 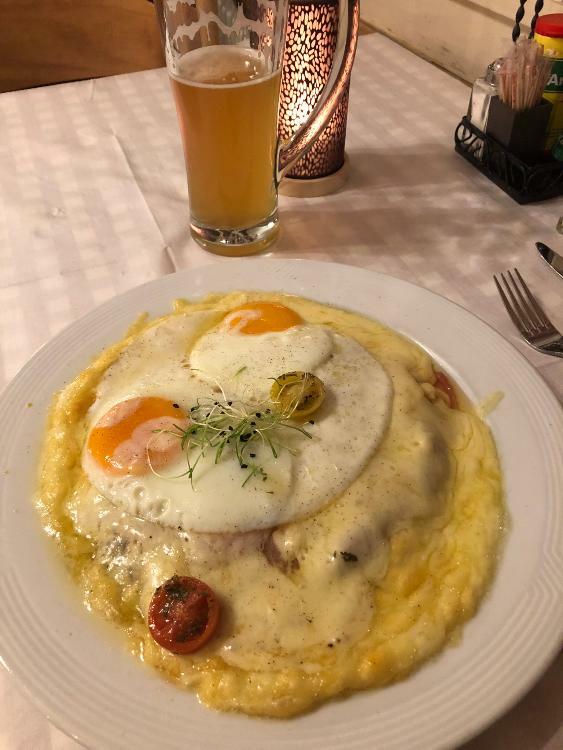 I love me some rosti and that was my go to Swiss comfort food nursing my jet lag. Having my nightcap at the hotel bar the bar man didn’t sound too optimistic about how the off piste would be after the snow, wind and warming temps. I was up early and on the first cable car out of Wengen to the Grindelwald side where most of the skiing is. 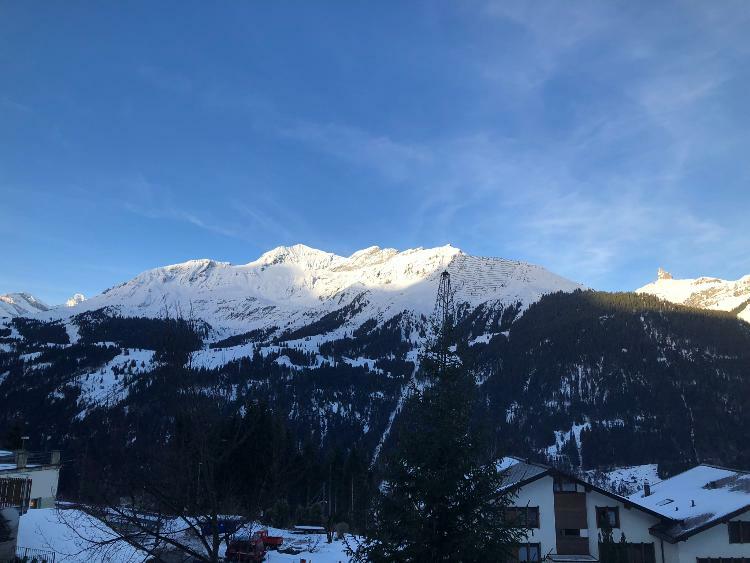 There is a valley on each side and a 10 mile long ridge with peaks along the way and the Eiger and jungfrau with hanging glaciers across from the Ski area. I had promised myself is would take it easy until I understood how the snow was and the lay of the land. That lasted about half a run. The top section was great pow but there was a crust around 1700-1800 meters. I skied 3 runs in that first bowl until the lift lines built up and it was time to move on. I was in a lift line and heard a decidedly American accent. Rob was an ex pat and was married to Claudia a beautiful Swiss women. They were about my age and lived in Zurich. They offered to show me around their home mountain with the caveat that like most Euros they don’t ski off piste. They would suggest where I could ski pow next to the piste and where to meet up. After many runs togetherness i spied a sweet looking off piste line that I had to ski. Rob explained how to get there and we exchanged cell # and decided to meet up for beers in the village later. The views of the Eiger and Jungfrau peaks and thier glaciers are unbelievable. This line required 2 lift rides and skiing literally behind a restaurant where people were drinking outside. It was seriously one of the best pow runs of my life and I proceeded to lap it 4 times over the rest of the day. The snow was great and the pitch rolled over several times and the trees were widely spaced so you could make GS turns with great flow. I had a miss later in the afternoon when the sun and aspect had baked out a very promising looking long line. That was a lot of hop turns and my legs were toast. 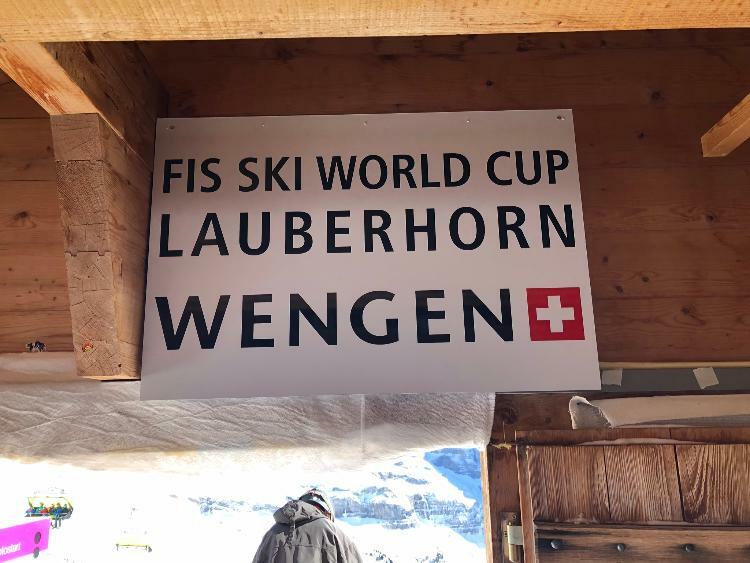 From there I had a beer at the Start Hut Bar and then skied the Lauberhorn DH course which is the one that goes thru a tunnel under the train tracks back to Wengen. It was definitely a top 5 life powder day. I met up with my new buddy Rob for beers and to watch a Rugby game at the English bar which happened to be directly across the street from my hotel. I could definitely become a Rugby fan. It was a super fun couple hours. The next morning a storm started to blow in so based on wind direction about 2/3's of the ski area were on wind hold. 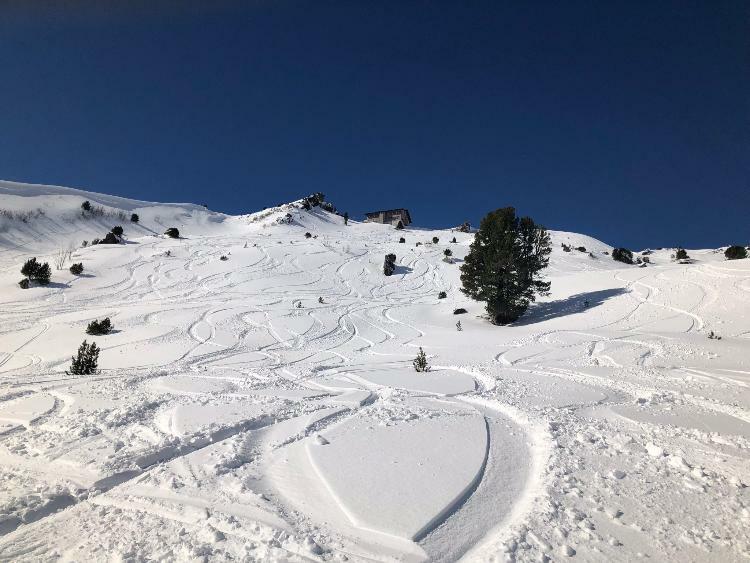 The off piste also was toast due to the warmer temps Saturday afternoon and the wind. I did find one aspect that had some nice wind buff. It was off the side of a lift and I think the Euros thought I was nuts but it was pretty fun and good for several laps. 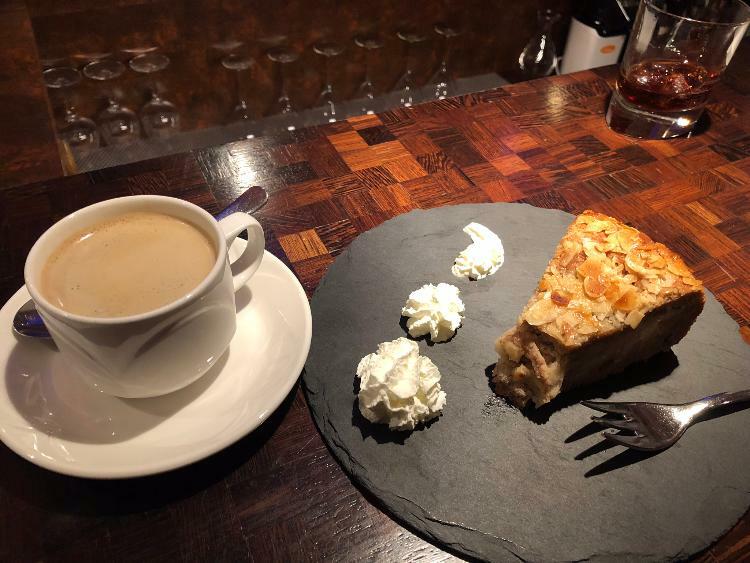 I asked myself what James would do on such a day and I went and had some Kuchen. Sometime after that I noticed the lifts that were open were stopping a lot so I bailed out and rode the cable car back down to Wengen. 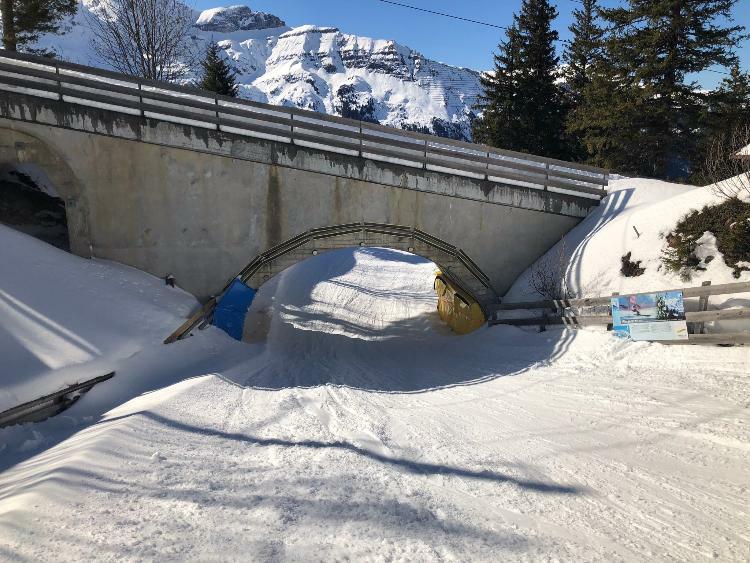 If that shut down I would have to take a hour long train with several connections down the valley and back up into the Wengen side of the mountain. I took a quick shower at the hotel's pool area and caught an earlier train to Zurich to meet back up with my counterpart for the drive up to Stuttgart. 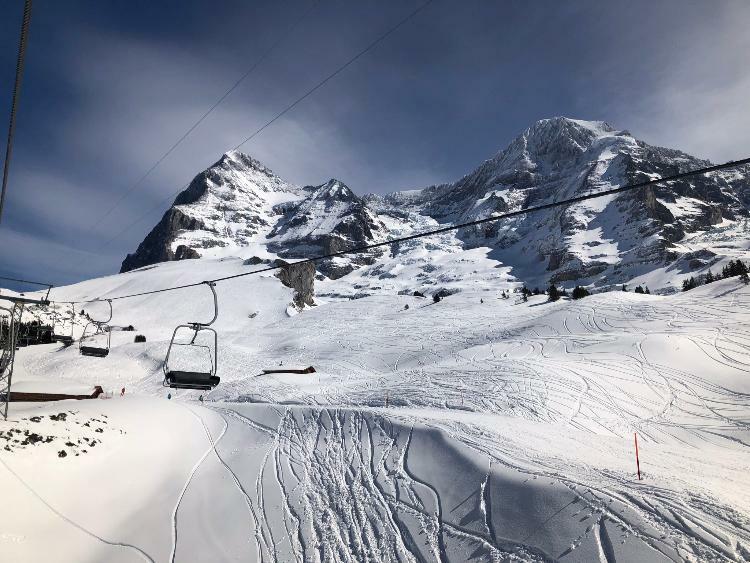 the Eiger is on my bucket list of mountains to see..
Glad to see you checking off that bucket-list entry (almost exactly one year after my visit) and nailing all those powder runs. Too bad that you didn't have time for the other two sectors: First and Schilthorn/Mürren. How are you going to go back on the farm after you've been to the Jungfrau, huh? like most Euros they don’t ski off piste. 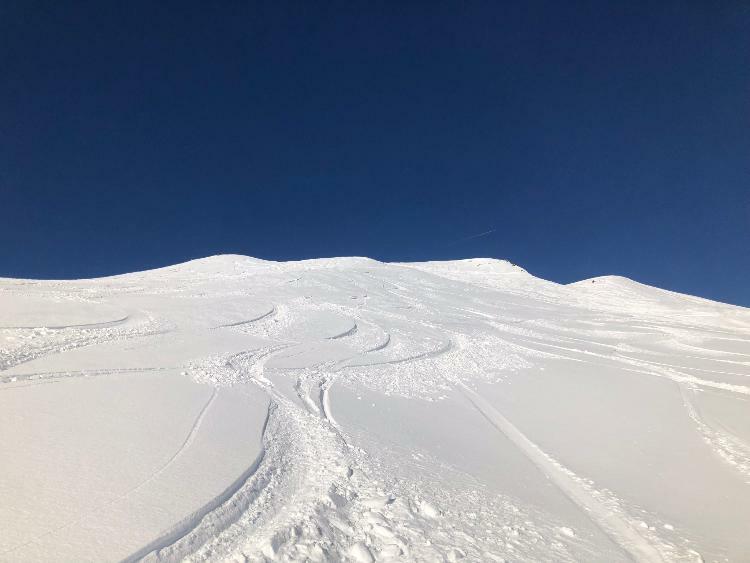 Anecdotally, I agree that percentage-wise, Euros tend to be much more on-piste oriented than North Americans and often take it as a personal affront when trails aren't groomed to their satisfaction. At the same time, I think that the reason for all that often untouched snow is that the skiable terrain there (even at smaller areas) is so vast compared to here. Moreover, they don't have the mad powder frenzies that you see here at places like Alta/Snowbird: nein danke. If given the opportunity, Jason would eat rösti for breakfast, lunch, and dinner. That doesn't look like the Rosti's that I had on my trips to Switzerland. Usually the potatoes are grated and fried like a potato pancake.. It still looks good .. Awesome, Z! Wengen is probably #2 on my list - behind Kitz - anywhere on the planet. I hope the train was going over the bridge as you skied through!